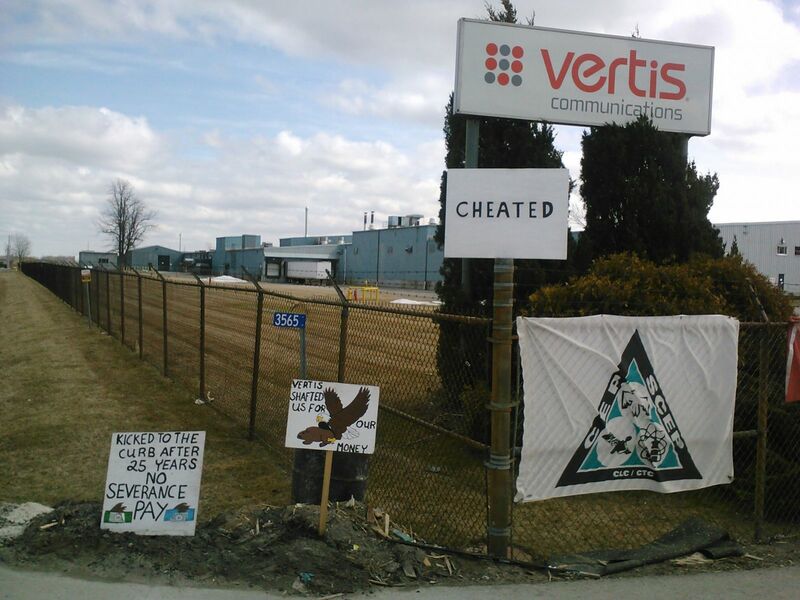 The workers and former members of CEP Local 425G have been picketing the Vertis plant at 3565 Eagle St., Stevensville for over a month, and 24/7 for several weeks. The owners have filed for bankruptcy in the USA and the workers have been unable to get severance pay. Now that the owners did declare bankruptcy in Canada, the workers do have a recourse to the Wage Earner Protection Program, WEPP (http://www.labour.gov.on.ca/english/es/pubs/wepp.php), but have to jump through legalistic hoops to access it. Even if accessed, the amount per worker would be far from their rightly and legally deserved severance pay they are elbile for by law. Clearly, the law is not blind and just as we are lead to believe and workers can be treated as disposable. A February report by a 4207 member and a Niagara Regional Labour Council Delegate. A LIVING WAGE AND A SAFE WORKPLACE FOR PORTER WORKERS! The members of CEP Local 425G have been picketing the Vertis Communications plant at 3565 Eagle St., Stevensville for over a month, and 24/7 for several days. The owners have filed for bankruptcy in the USA and the workers have been unable to get severance pay. These workers could use support on the picket line from 7 am to 10 am on Monday and Tuesday, February 25th & 26th. The owners have not declared bankruptcy in Canada so the workers have not even been able to access the Wage Earner Protection Program, WEPP (http://www.labour.gov.on.ca/english/es/pubs/wepp.php). You can also visit https://www.change.org/en-CA/petitions/ontario-mpps-repeal-bill-115-2 to send an e-mail to your MPP, putting the pressure on to repeal Bill 115. Members of ETFO Niagara Teacher and Occasional Teacher Bargaining Units have been on legal strike since December 3rd, withdrawing voluntary activities and administrative services from their employer, the District School Board of Niagara. The teachers will walk out for one day on Tuesday, December 11, 2012 to highlight lack of progress in bargaining the undemocratic restrictions that Bill 115 imposes on collective bargaining. ETFO, OSSTF and CUPE have filed court challenges against Bill 115, which gives the Minister of Education the power to end strikes and impose collective agreements without access to interest arbitration. It also cuts sick days in half, even though workers in public education on average currently use less than half of their annual allowable sick days, and mandates the loss of banked sick days. The bill also freezes pay grid increases that were due in September to teachers with fewer than eleven years experience. Even though unions have offered to accept zero percent increases in each of the next two years, the Liberal government, backed by Tim Hudak’s PCs want to impose their anti-union agenda through Bill 115 then move on to other public sector unions.